After watching Red Riding Hood (2011), starring Amanda Seyfried as Valerie, the main character, I was reminded of the mass hysteria section of the textbook and the chapter in the book Why People Believe Weird Things; it is not exactly the same as a mass hysteria event, but it had similarities. In the movie, the setting is a remote, medieval village on the edge of a forest up in the mountains. The village has been terrorized by werewolves in the past, and the attacks start up again because it is getting close to the blood moon, which is the only time a werewolf can pass on the curse to another person. Normally the villagers make sacrifices of their finest livestock every full moon in order to keep the werewolf at bay. After Valerie’s sister is killed by the wolf, the Father of the village church calls upon Father Solomon, a known werewolf and witch hunter. Father Solomon and his group represent the more powerful group of people internally controlling the villagers. They don’t let anyone leave their homes during the night; they go through everyone’s belongings searching for evidence of the werewolf or witchcraft. During one of the searches, Father Solomon and his men discover a boy hiding in a tower, who has a card with the devil painted on it because he likes doing magic card tricks. The boy has some kind of mental handicap, which is obvious to everyone. Despite this, Father Solomon uses the card as clear evidence that the boy is in touch with the black arts and his twisted speech is apparently evidence that he communicates with the devil. When Father Solomon demands to know who the werewolf is, the boy is silent, and therefore, gets put into a metal elephant with a fire lit beneath it as a form of torture to get him to tell the truth. The boy’s sister, Roxanne, goes to Father Solomon to bargain for her brother. She uses the information that she knows of a witch, Valerie, because Valerie was able to communicate with the werewolf and Roxanne witnessed it happen. Valerie gets put in chains and brought in front of the people of the village, so Roxanne can accuse her of being a witch. Roxanne claims as her evidence that Valerie can climb the tallest trees, grew faster than the other girls, wears a red cloak, which is the color of the devil, and can speak to the werewolf. Valerie does not deny any of the accusations, which seals her fate as being considered a witch in Father Solomon’s eyes. He suggests they sacrifice her to get to the werewolf, and anyone who opposes that get silenced. The majority of the people is silent or agrees to sacrifice Valerie though. This is an example of when people start to accuse and be accused. Because Father Solomon told the villagers that the werewolf lives among them, the villagers are all suspicious of each other, are quick to point fingers, and paranoid. Peter and Henry both care about Valerie, but both are still both suspicious of the other being the werewolf. 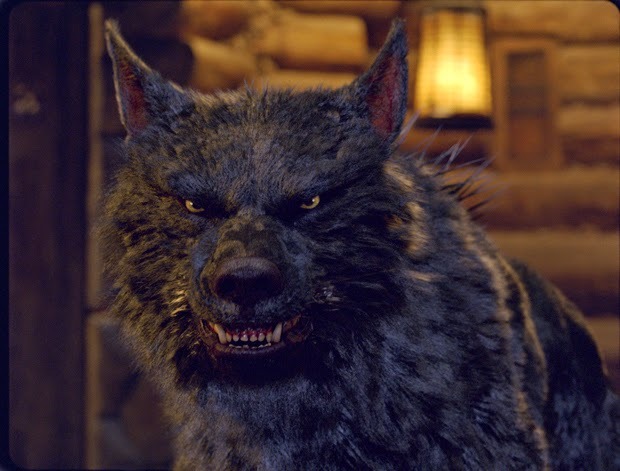 Also, while Henry is working in his blacksmith shop, Valerie’s grandmother comes in and accuses him of being the werewolf, but Henry throws the accusation right back at her because he claims she smells just like the werewolf. Henry knows the smell because he was there when his father was killed by the werewolf. Valerie’s father also gets arrested because Father Solomon doesn’t trust anyone associated with the witch. Accusations, paranoia, and suspicion are controlling everyone’s actions. After Henry saves Valerie and is leading her to safety, she pulls her knife out because she is not sure whether or not he is the werewolf. Shortly after, Valerie tries to take sanctuary at the church, but Father Solomon forces her to stay off the grounds to lure the werewolf out. However, some of the villagers change their minds about condemning Valerie and pull her onto the church grounds, pushing her behind them to protect her. The next day when Valerie is on her way to visit her grandmother, she runs into Peter in the woods and stabs him in the stomach because she thinks he could be the werewolf too. He was missing the night before while the werewolf was in the village, so she no longer trusts him. I won’t tell who the werewolf is because I don’t want to ruin the movie for anyone who wants to watch it…so many people are accused and suspected that you’ll never predict the werewolf. In today’s world, werewolves are mythical creatures that some people do actually believe exist. In the movie’s story, werewolves are actually real and have been terrorizing people for hundreds of years. The way the villagers respond to this particular crisis is similar to the way people acted about witches. An initial person was accused of participating in the black arts, demons, etc., which caused other accusations to come about. A smell was associated with the werewolf, and a more powerful group of people came to hunt it down, taking control away from the villagers and instructing them on how to identify someone associating with the werewolf such as witchcraft. As the hysteria went on, however, some of the villagers who had condemned Valerie protected her in the end when the werewolf was there to take her. Father Solomon, who had initiated and encouraged much of the paranoia, was killed by one of his own men too. The tables turned.